The trendy look and sturdy construction makes these dog athletic shoes perfect for protection, play and to show off that great sporty dog look. Laces stay secure as they accent the look of real sneakers. 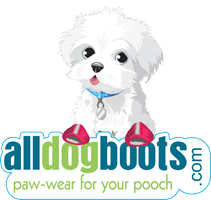 These running dog shoes are the all around perfect paw-wear for your dog. You can just tighten the laces, tie a bow and go! These pink canvas "Converse" style dog sneakers are designed for fashion and fun. STEP 2: Print the paw print image chart. Images are the inside dimensions of the shoe. 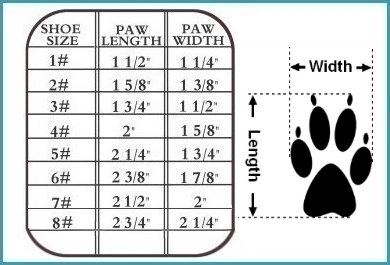 Place paw directly on printed chart. I was very pleased they had shipped out my order the very next day. It did take 5 days but I'm all the way out in CA. The sneakers are super cute and don't slip off if you get the right size. Follow the size chart.... I found it to be very accurate. I purchased sizes 1and 2 in pink and 3 in the blue. I have two tiny dogs. Size 1 fit my 4lb with skinny ankes. Size 2 worked for the bigger guy, but not much. 3's were too big, but I won't return them because they filled my order so quickly. I'll just donate them. I placed another order today for two pairs of sandals. I ordered these with guidance from the AMAZING Karen of alldogboots, and they are perfect. My yorkie wears these around the Upper East Side of New York on our walks and both men and women alike comment and ask me where I bought them and if they come in different colors. These shoes are so cute on my little Yorkie. To keep them extra snug on her tiny ankle, I wrapped the laces around her ankle and then tied them. They've stayed on great even on long walks! Great quality and great service! These are the cutest shoes! Easy to get on and they actually do stay on. The laces are long enough to wrap around my dogs tiny ankle. She walked great in them! Great service too! Thanks Karen! These shoes were purchased for a frisbee dog who runs and jumps in them in an area full of cactus. The shoes could be a bit more durable. We are going to take them to a local shoemaker and have them made a bit more sturdy. (The outer rubber is pulling away from the sole). We also wish the laces had finished ends because they have to be completely unlaced and relaced to get a good fit. She wears these for several hours at a time while running and jumping and they stay on her feet (once her daddy got the hang of putting them on).